A late start due to morning appointments and a hot day added up to very little yard sale shopping opportunity. The drought in sales led me to follow signs for one sale which I never could find. The only other sale I happened upon would have been great if I was searching for kid stuff, but I wasn’t. 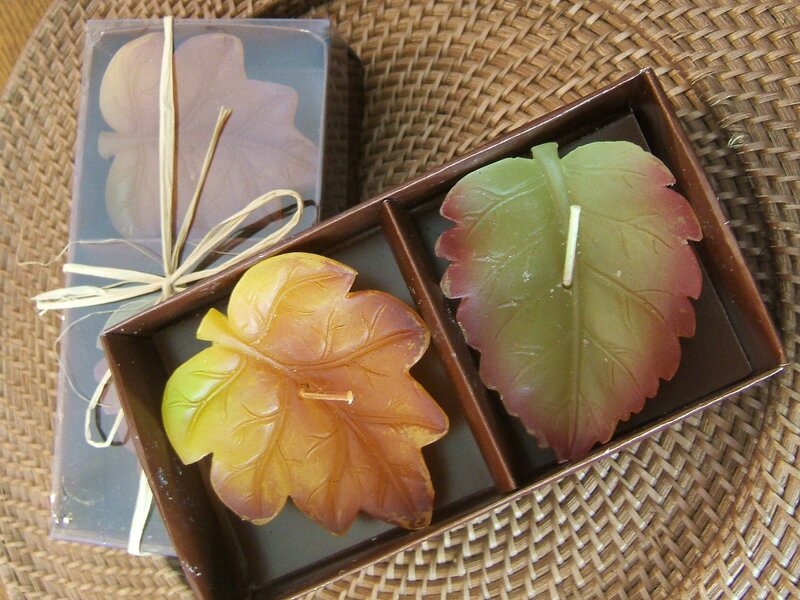 I did find leaf-shaped candles which will be useful in future tablescapes, I’m sure. My wonderful friends, however, have kept me supplied with thrifty gifts to share. 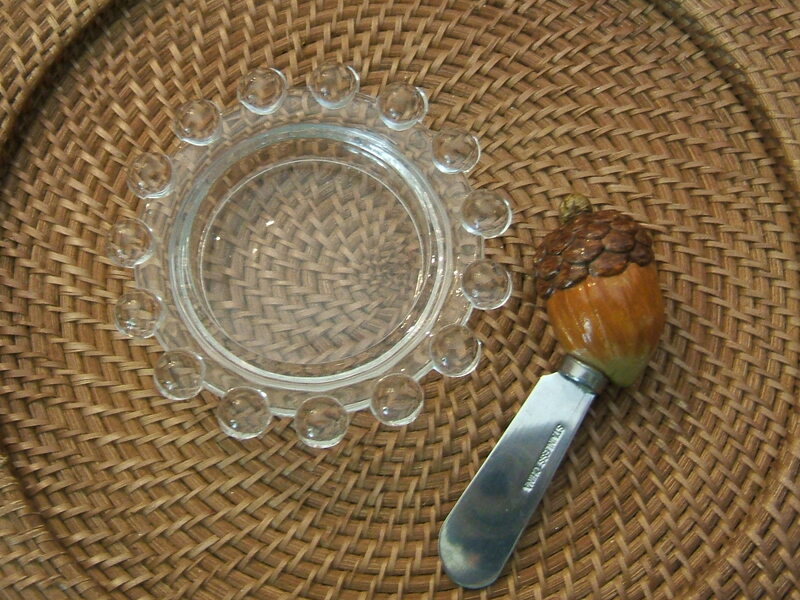 Keeping in-line with fall-themed tablescapes, “S” found an adorable acorn adorned spreader. She also gifted me with this sweet candlewick plate. I believe it may have lived its life as an ashtray at some point, but no more. It will be a very welcome addition to my collection with multiple use possibilities. One of my blog-reading co-workers came upon an Avon American Heirloom series bowl in the Independence Day pattern and decided to gift it to me. 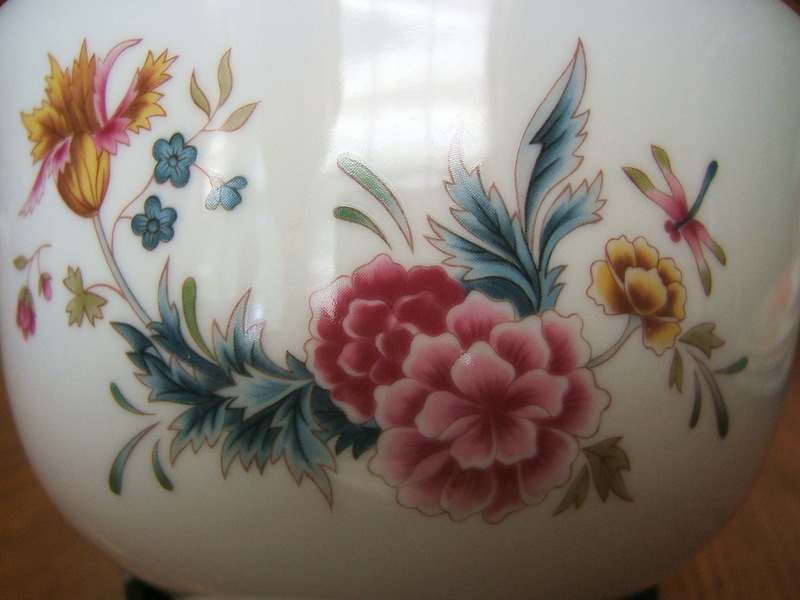 The sweet flowers on this bowl are charming. I’m sure we will see this in a future vignette or tablescape. 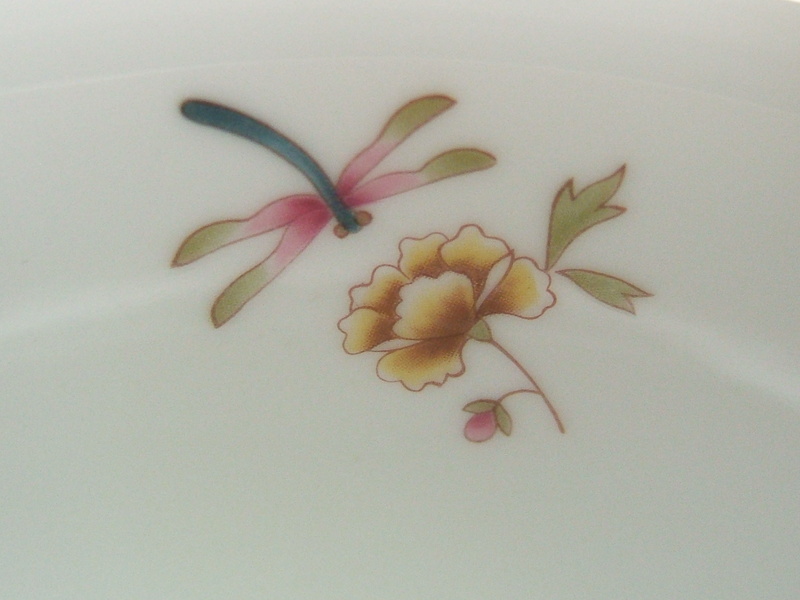 The little dragonfly appears again on the inside of the bowl; so sweet. Thanks, “DH”! This next thrifty gift had me squealing with delight. After spying one of these in an antique store for a not-so-thrifty price and deciding to pass, “S” found this in our favorite lunchtime thrift and grabbed it up for me. I had never seen one of these before. From what I can learn, it is a little glass creamer that was given away as a premium in Post Grape Nuts back in the 1930’s. This one has a number 23 on his underside. Isn’t he just the cutest thing? I love him and am so thankful to have a generous friend with a great thrifting eye. Thanks, “S”!! Yard sales may have been few this particular week, but thanks to my friends and their thrifty gifts I had a spectacular week. I hope to join the parties at Flea Market Finds at Her Library Adventures, Apron Thrift Girl’s Thrift Share Monday, Today’s Thrifty Treasures at Southern Hospitality, Nifty Thrifty Tuesdays at Coastal Charm, Thrifty Thursday at Tales from Bloggeritaville, and Thrifty Things Friday at The Thrifty Groove, and The Penny Worthy Project at Hey, What’s for Dinner Mom? This entry was posted in Dishes, Garage Sales, Scotties, Thrifting, Vintage, Yard Sales. Bookmark the permalink. I saw one of those little Grape Nuts marked creamers the other day! I think it is sooo sweet and wanted one! Lucky you! Wow! You sure did score with your friends finds. Isn’t it wonderful to find stuff for others when you thrift. I love the candlewick dish and that creamer is beyond cute! I love the creamer, it is adorable. 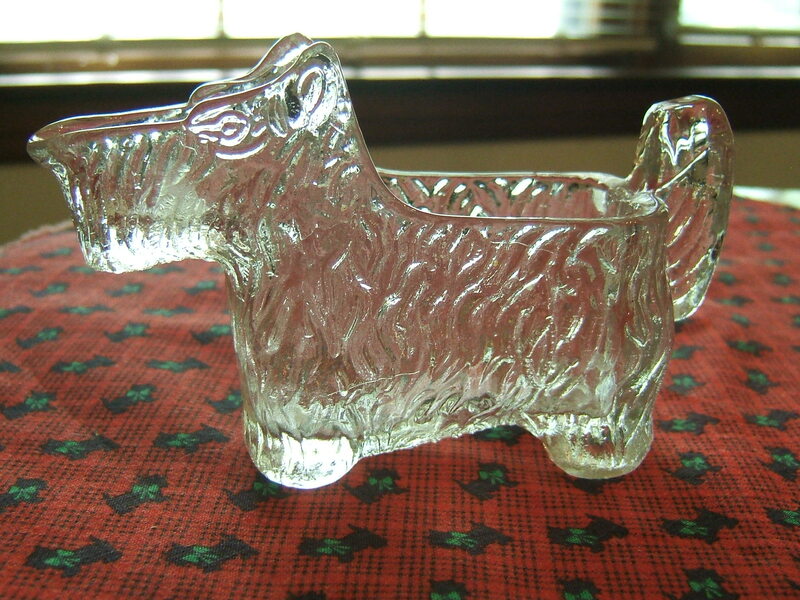 I have never seen a Grape Nuts clear glass dog. I have to put that on my pay attention list! I have the same Scottie creamer but never realized it was a cereal premium, wish we found such fun things in our box today! I need to get me some friends like yours… love the scottie dog! I hate it when I can’t find a garage sale I had planned to attend!! Love all of your finds. I’ve never seen one of those Scottie creamers before!! Very cute. 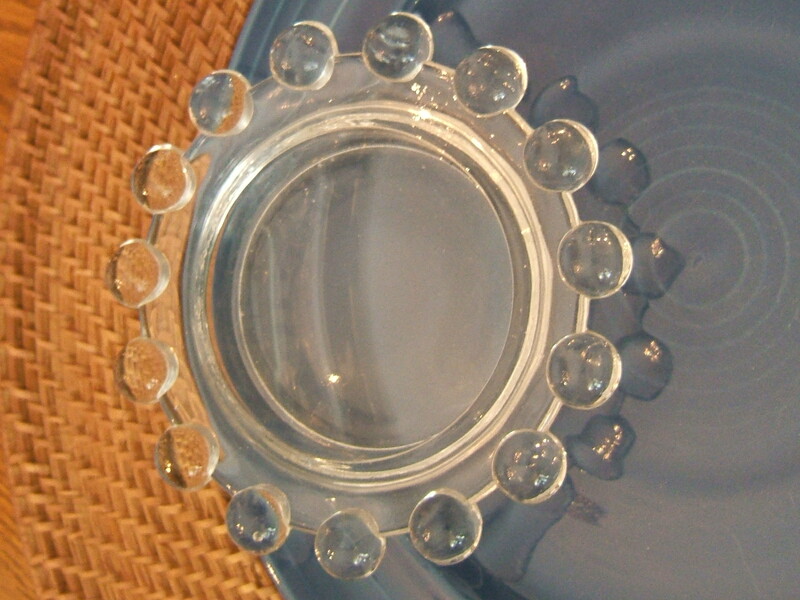 Thanks for highlighting the bowl – so glad you will be able to use it. And the gift from “S” of the Scottie creamer is too, too cute! So, now that you have this little guy, any chance I can score a chance at the other doggie creamer you obtained a few weeks back? I thought not ….. Happy Week to you! P.S. LOVE the acorn spreader too – precious! I’ve found you through Cozy Little House. Yea! Looking forward to seeing more. I, too, have an Avon American Heirloom piece, a small covered casserole. I found it years ago at a yard sale here in Alaska. I sold a creamer just like that out of my booth a few weeks ago. He’s just adorable, isn’t he? I have had one of these tucked away for years and knew nothing about it-not even the fact that it is a creamer!! Thank you so much for sharing!